Rathna Sharad knows a thing or two about style. The CEO of the online boutique, Runway2Street, Sharad has an eye for detail, curating select fashions by emerging designers from around the globe. An avid traveler, Sharad has traveled to over fifty different countries, "It invigorates and inspires me, I love exploring new cultures, and getting to know people through food, architecture and fashion.” And her love of travel and exploration shows not only in the curated style of Runway2Street, but in Sharad's Seattle home that is filled to the brim with globally-inspired design. 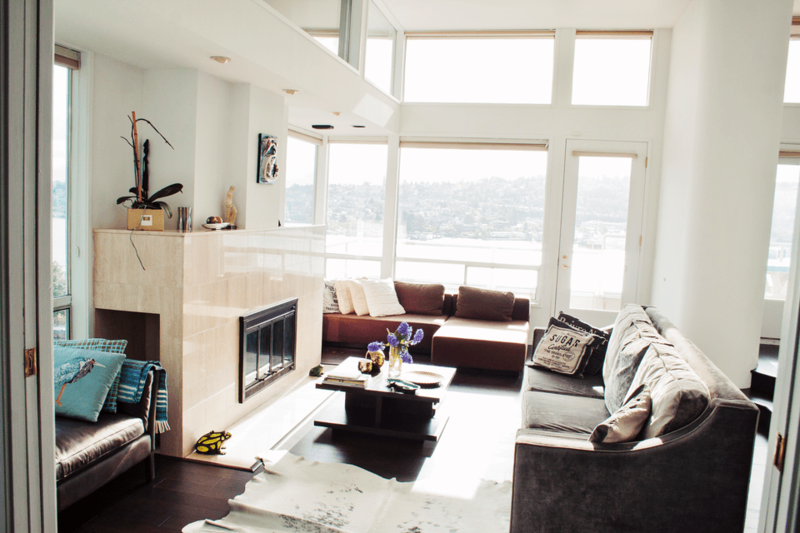 A perfect blend of modern and contemporary elements, Sharad's Seattle penthouse is effortlessly chic. Inspiration ranges from the Greek Isles to Paris, with pops of color and metallics added to the mix. "Furniture with clean modern lines mixed with a bit of old world are a nod to the Parisian interiors I love. Lots of textures from velvet to sheepskin and distressed leather with pops of color come in the form of things acquired from travels around the world." The home office feels like the heart of this interior. Sharad's sanctum, where she can focus on building the brand that allows people to shop the best in fashion from around the world with just a click. A unique design decision - a gray-blue chalkboard wall is the ultimate statement piece in the space, adding a dark backdrop to the mix of eclectic home furnishings and accessories. It's clear that this is the home office of a fashion-savvy girl boss. Lining the shelves in Sharad's office are a pair of golden pumps; a selection of jewelry, purses and a collection of favorite fashion books, for a chic display. At home and in her career, the philosophy is the same, "“I love to experiment according to my mood and inspiration on any given day. I can go from feminine and glamorous to channeling my inner rocker girl all in the same day. There is always a unique, unexpected twist. And I absolutely cannot live without accessories, I love to play with them to create new looks!" The interior mainly features white walls, but in the hallway a transitional space has been accentuated with a turquoise statement wall. A nice pop of color in the space. "I drew inspiration from the Greek Isles overlooking the Caldera. All the walls are bright white, maximizing the sense of space and lightness which is very important in Seattle where we don’t see too much of the sun. There is a bright turquoise blue accent wall keeping with this Greek theme." The view is an incredible perk in this Seattle penthouse. Floor-to-ceiling windows overlook an expansive view of Lake Union and the mountains beyond. Whether in the living room, the bedroom, or the kitchen, this amazing view is there. A treat for Sharad, who admits to being a water lover with scuba diving as one of her favorite things to do while traveling. In the dining room, a textural display makes a statement in the space. Philippe Starck Victoria Ghost Chairs offer modern seating that don't block the home's expansive view. Sheepskin throws add texture to the dining area, while a rustic table completes this eclectic vignette of furnishings and accessories. The bedroom is a place of respite. The serene environment is defined by white walls, and a cozy lavender blanket that adds a soft touch of color to the space. The closet is the ultimate "girl cave", featuring a colorful collection Sharad's clothing and pumps. Her love for color and fashion formed early in life, inspired by the wardrobes of her mother and grandmother. Recounting early memories, Sharad recalls discussing color for hours as a child, reflecting on pieces made for her and her sister by her mother. Whether in fashion or at home, for Sharad, style comes first. The discerning eye of this fashion maven has truly lead to an effortless display of beautiful details at home.